Sometimes when you’re creating something as physically intangible as a website, you need to be able to piece it out longhand. Paper and pencil (or pen) gives you a chance to run your hands along the lines of the elements, feel the length and width under your fingertips, and give yourself time to conceptualize it. The good folks at Gridbooks recently sent me some samples of their product to try out. 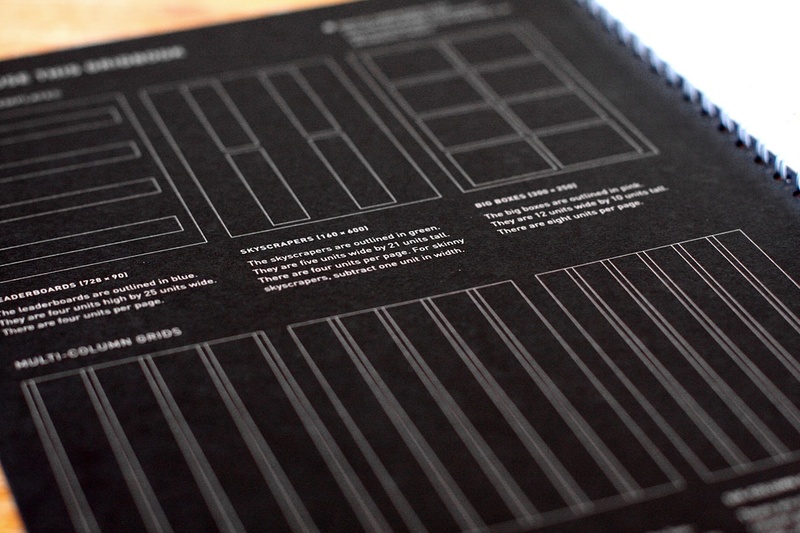 They produce really good quality notebooks with flexible grids for ad design and webpage layouts. I was excited, though I quickly realized that since I’m not a web developer, I couldn’t fully utilize their intricate grid. I needed a better, more experienced opinion. I handed the samples over to my friend Josh Tuck, a talented web designer and food blogger at The Quest for Zest, a great high-class local food blog. He produces some of the best, boldest, simplest grids I’ve seen. And since he’s the one from whom I learned about Gridbooks in the first place, I knew he’d be interested in giving them a try. When I was in college, print design on computers was just beginning to crawl out of its infancy into toddlerhood. Our school couldn’t afford speedy new Mac 9500s, so we learned paste up with actual paste instead of “cmnd+v”. I carried this pencil-and-pad approach to laying out ads into my career in advertising. I noticed that when I sketched ideas, for ads or websites, the final result was always better then when I started designing on the Mac. 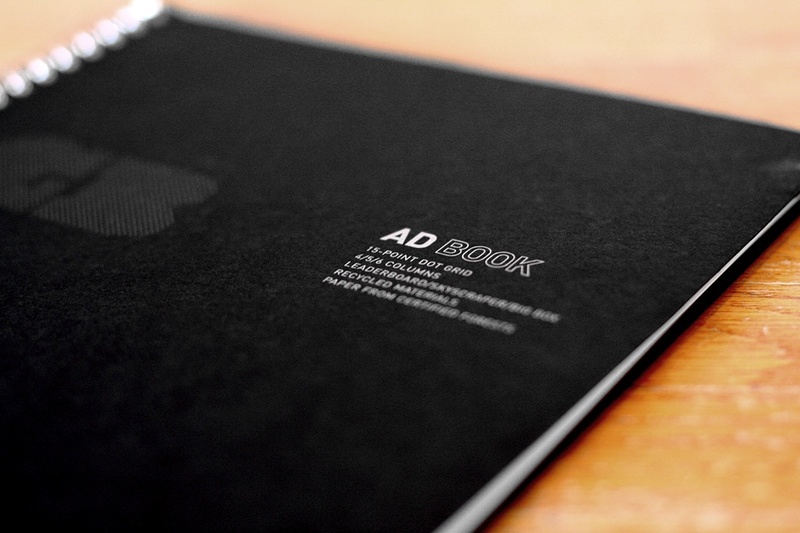 So, from an old-school designer’s point of view, Gridbooks are spectacular. 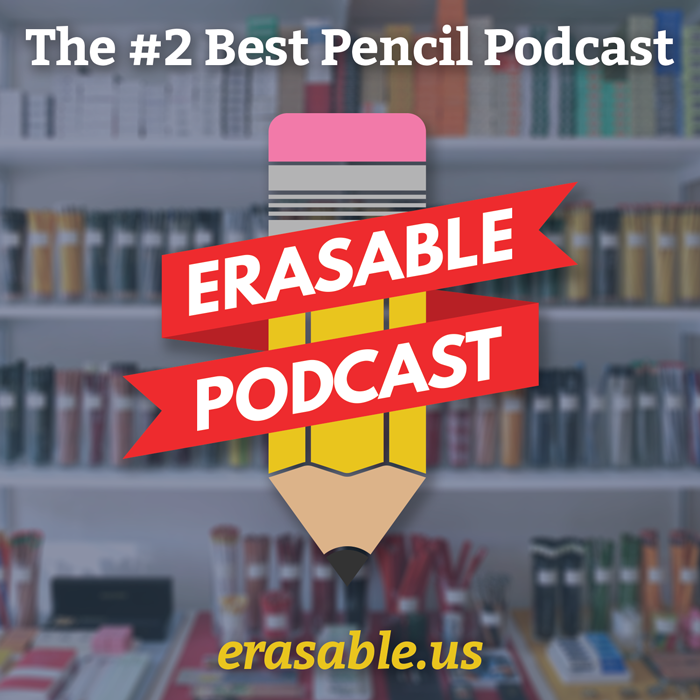 Halfway through testing – with markers, pencils, and circle templates scattered on my desk – I wondered, “Why the hell wasn’t there something like this years ago?” They give you just enough guidance to make concepting easier without getting in the way of the creation process. 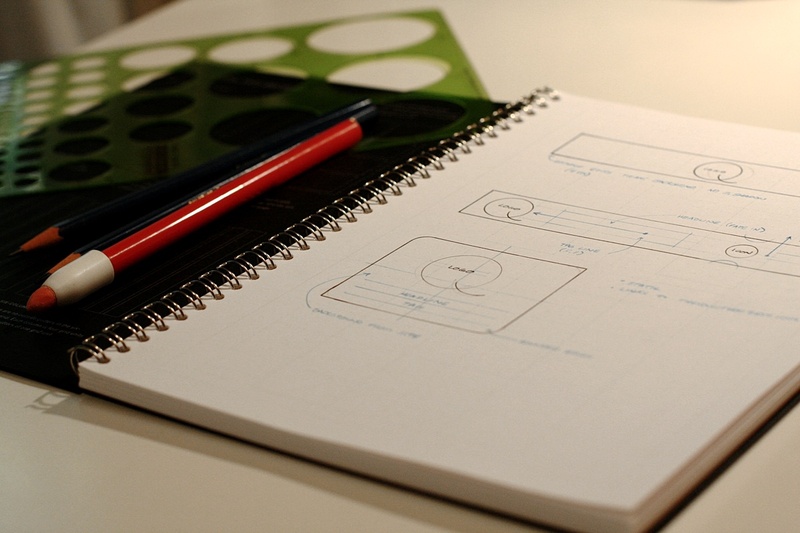 They are surprisingly versatile, effortlessly usable, and beautifully minimalistic. That beauty is only “so” nice though, and I like that. 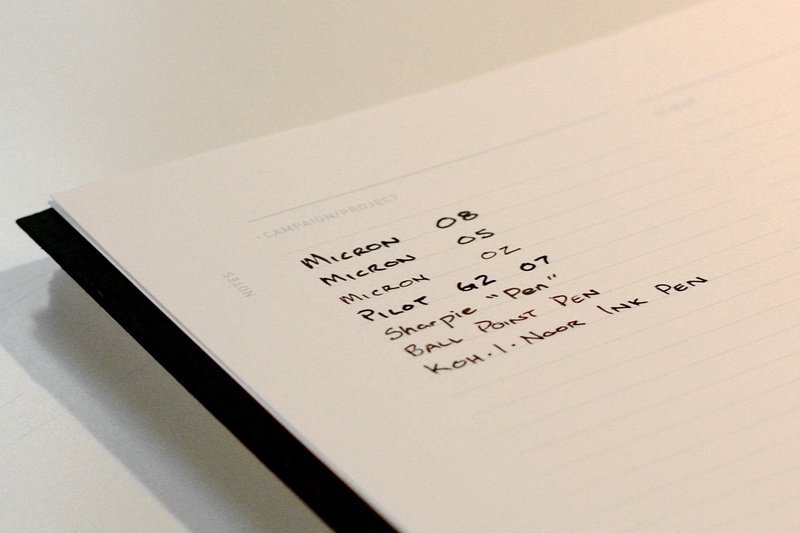 As any proper pen and pad snob will eventually confess; if the product is too nice, it risks never being used. I have a stack of sketchbooks and a mug of like-new pens because I am terrified I will ruin them by scrawling something unworthy of their perfectly designed form. Not so with Gridbooks. While they are attractive enough for any designer to carry into a brainstorming session they aren’t so good looking that they will never get used. The cover of the Ad Book is a toothy 80 lbs. cover stock. 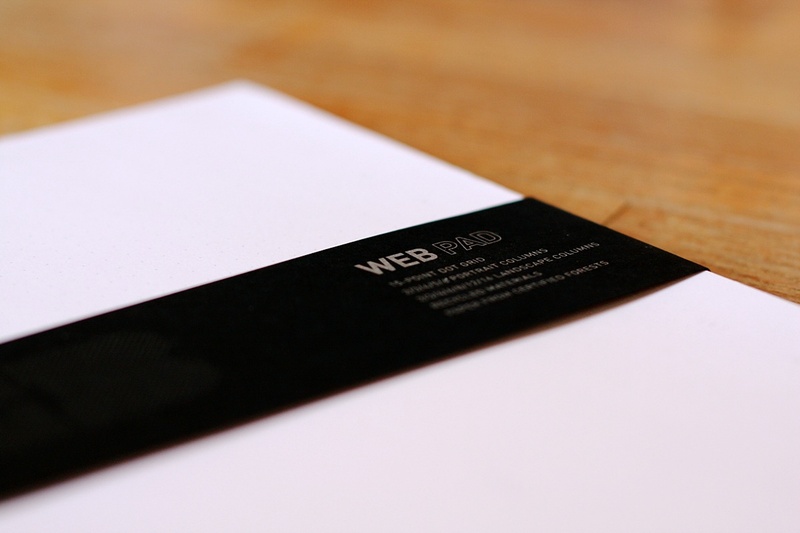 It’s folded over on itself for added weight and it’s discretely printed in silver ink. The paper for the interior pages is an 80 lbs. text weight with just the right finish for pencil or pen. The grid lines and dots are just visible and all but disappear under your sketching; a feature I wish I could get from a certain Milan-based notebook company whose products I covet more then my next breath. 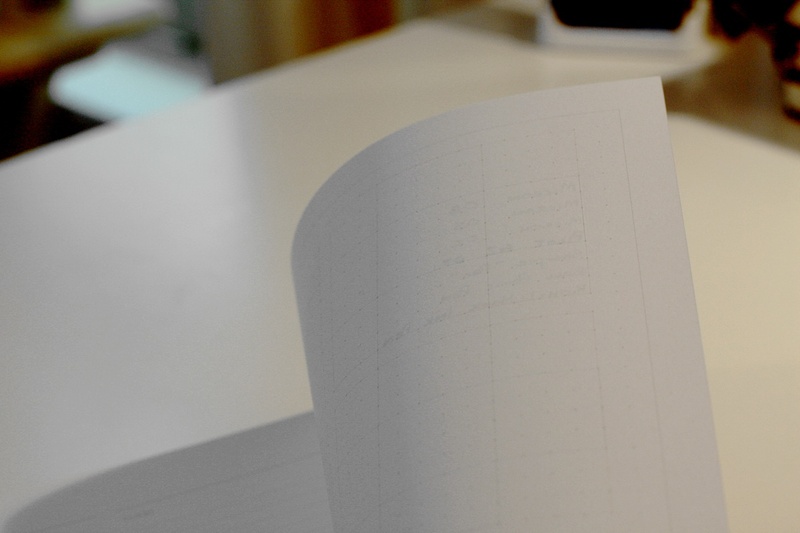 Gridbooks also use an ingenious technique of overlaying many grids on the same sheet. All the key ones are there; banner ads, skyscrapers, and big boxes. Each one is color coded for easy identifying and they are all pixel accurate. The same is true of the web layout pad with it’s 960 pixel 8, 12, and 16 column grids in addition to 3, 4, 5, and 6 column grids. I tried a variety of pens and was pleased to find that they did not lose their edge or bleed through the page. You can truly use both sides of the sheet without fear of blotting up past ideas. Gridbooks are worth every dime of the purchase price. I firmly believe that sketching is still superior to jumping straight into Photoshop, Fireworks, or even Balsamic. 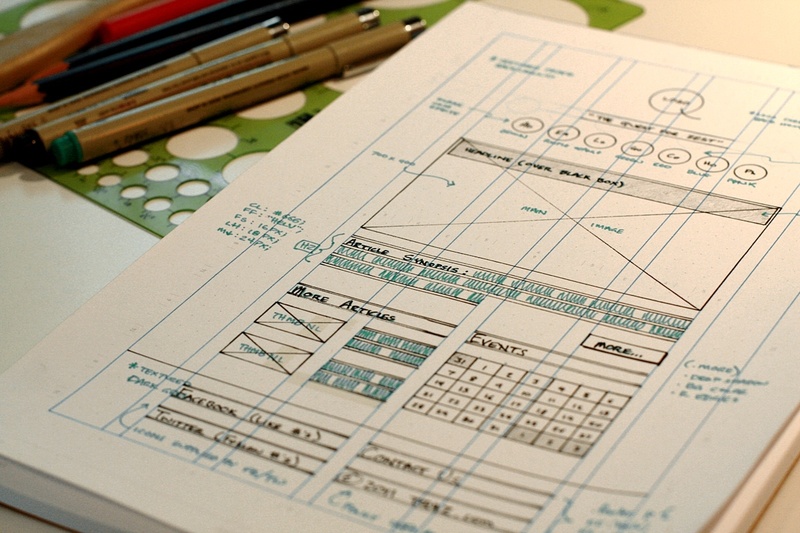 Sketching forces you to focus on the big picture and not get bogged down in the details and Gridbooks make that process faster and more painless then ever. All photos by Josh Tuck. (In fact, these are the best photographs this blog has ever seen! I need Josh to take all my pictures. I have been staring at these for some time. Now that someone I know and love has tried them out and given them a thumbs-up, or in Joshes case “5 tacos” I can pull the trigger. But I am still afraid these will sit in that OMG I CAN’T DRAW ON THESE pile. Sigh. These are definitely “Cinco Taco” worthy. I started using them again last night to thumbnail another website. Thanks for letting me keep these Andy… I, um, rescind my offer to return them.